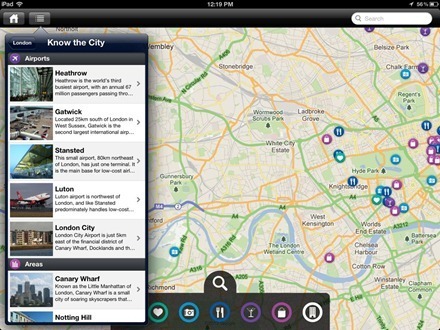 We believe that a great city guide should make you feel like a local. That’s why each and every GuidePal recommendation is handpicked by locals who want to share the best their city has to offer. It’s a very nicely curated selection of highlights and travel tips for a good number of notable cities around the world. 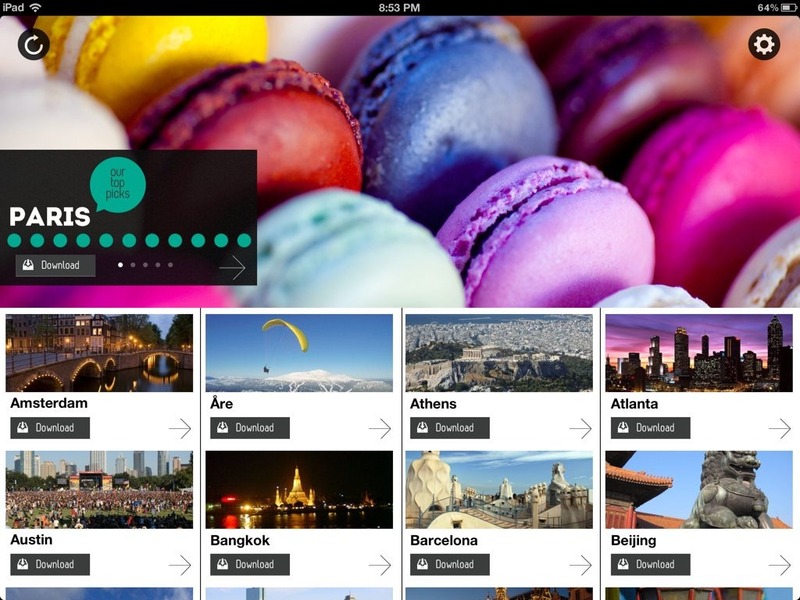 The app currently features 15 cities from The Americas, 29 from Europe, and another dozen or so from Africa, the Middle East, Asia and Australasia. I’m very happy to see that my hometown, Austin, is included. The app was only just released earlier this month and the cities list states there are more to come. When you first open the app you can sign up for a free GuidePal account, login with Facebook, or choose to skip this step altogether and register later. If you create a GuidePal account you can then add your first and last name in the app’s settings. 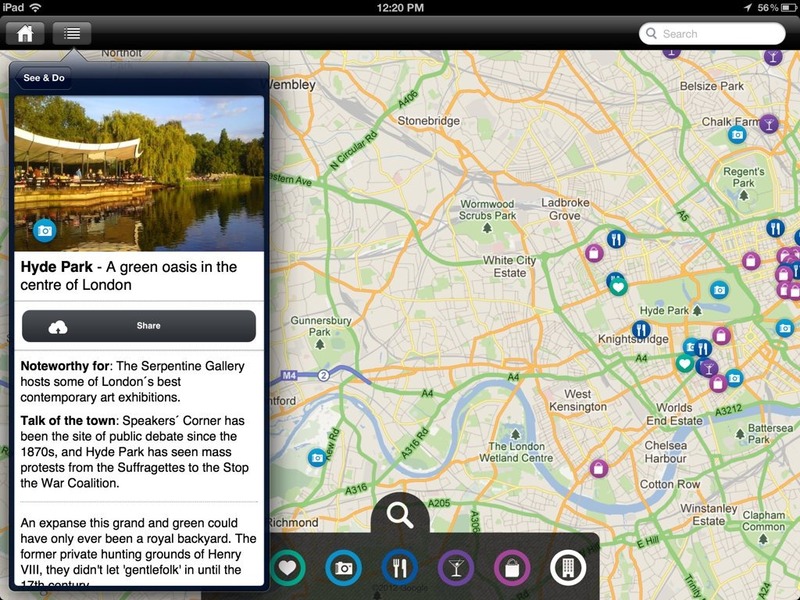 GuidePal’s UI is simple and attractive – and rightly focuses on the great cities it covers. 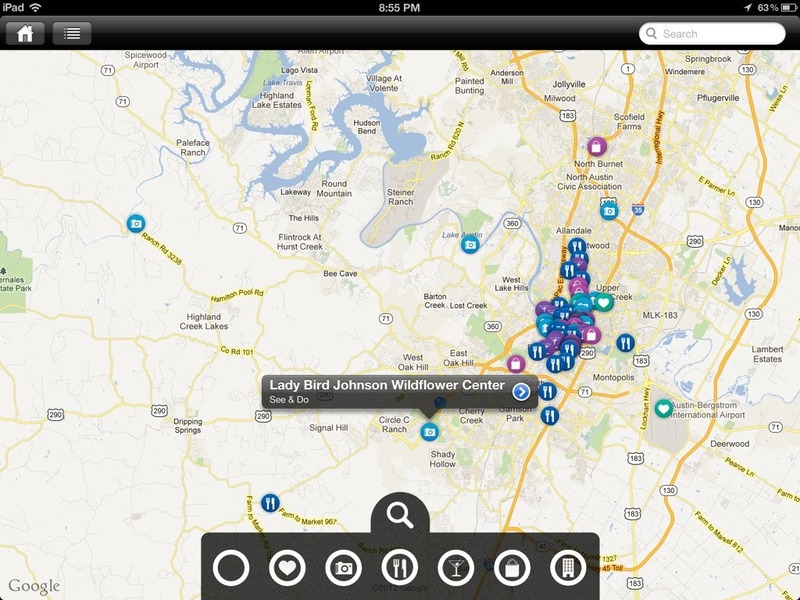 When you tap on any city you get a map view showing points of interest icons. It’s easy to zoom in and out in the view just as always with the built-in Maps app. Tap on any of those to vie details of that particular point of interest. 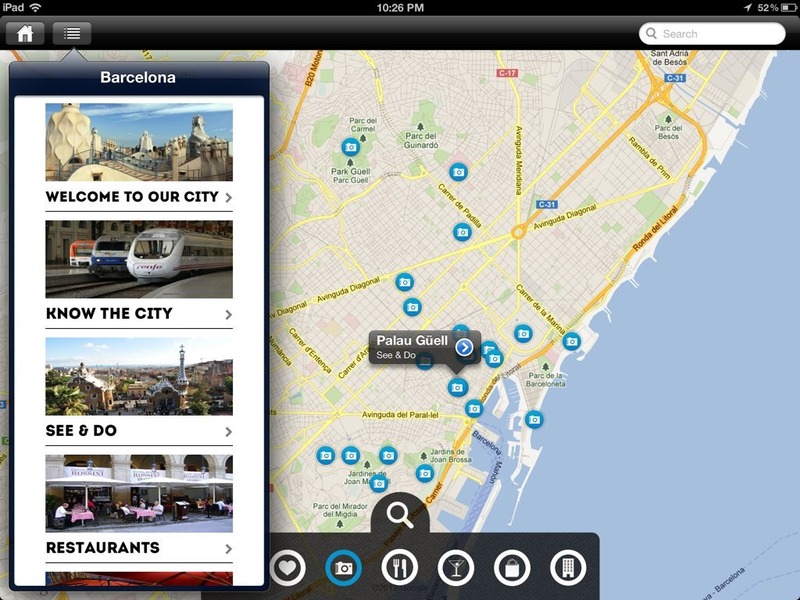 You can filter the POIs with just a few taps – to show all or just single categories like restaurants, bars and nightlife, hotels etc. When you tap on a POI icon on the map it brings up a nice popover that shows a photo of the chosen place along with a general description and a good set of details. Details for restaurants, for instance, include Popular Plates,opening hours, address and phone and website details, prices and a Word to the Wise section. You can toggle the details popover bar on and off with a single tap at the top of the screen. They’re a great starting point to browse through when looking at a city. For cities, it includes sections like Welcome to Our City, Know the City, See & Do, Restaurants, Bars & Nightlife, and Shopping. 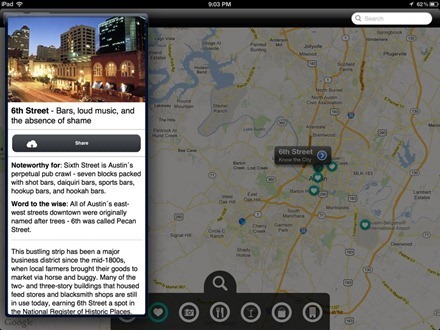 You can share to Facebook and twitter from within the popover for any location. I’ve browsed extensively through several great cities I’ve been lucky enough to live in or travel to frequently – including Austin, London, Madrid and Barcelona – and found the quality of the information and the suggestions and tips to be top notch. The useful tips are actually useful. I’ve also tried out downloading a few cities and checking them out offline – and the app works very well, just as advertised. This of course is a great feature for anyone traveling with this app. 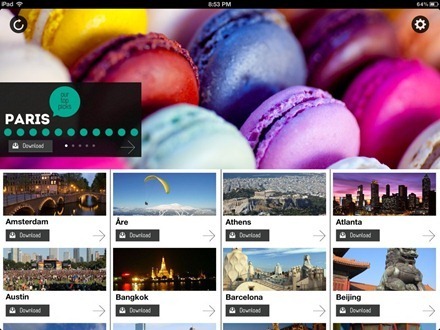 I haven’t done any major traveling for quite a while, but this app certainly puts me in the mood to get packing. 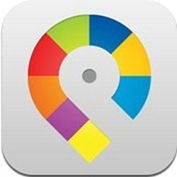 Here’s an App Store link for GuidePal Offline City Guides.